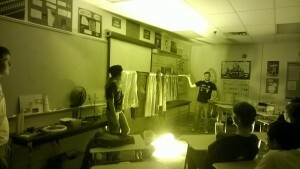 Hannah Rich and Chas Hammond demonstrate the sodium lamp at Mayfield High School, Fall 2015. 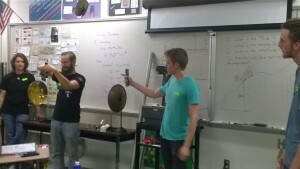 From left: Tegan Fuqua, Chas Hammond, Alistair McLean, and Jacob Wright demonstrate the induction of a magnetic field in a copper tube at Mayfield High School, Spring 2015. 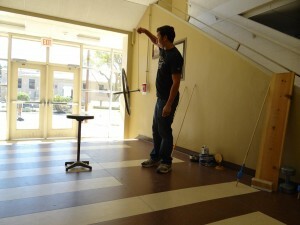 Dennis Trujillo explains angular momentum and precession to students at the Physics Fun Day, 2013-2014 academic year. 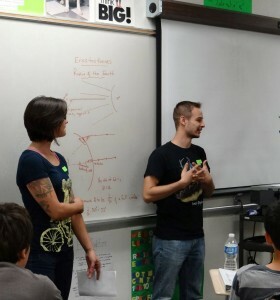 Chas Hammond and Khadijih Mitchell talk about their experiences as physics students at Mayfield High School, Fall 2013. 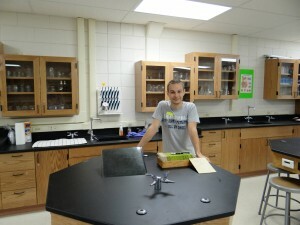 Chas Hammond gets ready to explain refraction to students, Fall 2013. From left: Alistair Mclean, Khadijih Mitchell, and Joni Cunningham talk to students about how they came to study physics, Spring 2014. 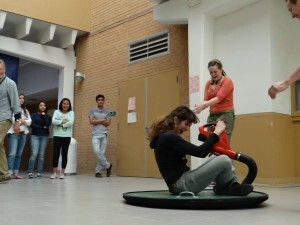 Hannah Rich demonstrates SPS’s hover board.